NSSE annually collects information at hundreds of four-year colleges and universities about student participation in activities and programs that promote their learning and personal development. The results provide an estimate of how undergraduates spend their time and what they gain from attending their college or university. Institutions use their data to identify aspects of the undergraduate experience that can be improved through changes in policy and practice. NSSE has been in operation since 2000 and has been used at more than 1,500 colleges and universities in the U.S. and Canada. More than 90% of participating institutions administer the survey on a periodic basis. This snapshot is a concise collection of key findings from your institution’s NSSE 2014 administration. We hope this information stimulates discussions about the undergraduate experience. Additional details about these and other results appear in the reports referenced throughout. Sets of items are grouped into 10 engagement indicators, organized under four broad themes. Below are summary results for your institution. For details, see your Engagement Indicators report. No significant difference. Your students’ average was significantly higher (p < .05) with an effect size less than .3 in magnitude. Your students’ average was significantly higher (p < .05) with an effect size less than .3 in magnitude. Your students’ average was significantly higher (p < .05) with an effect size less than .3 in magnitude. Your students’ average was significantly lower (p < .05) with an effect size less than .3 in magnitude. No significant difference. Your students’ average was significantly higher (p < .05) with an effect size less than .3 in magnitude. No significant difference. No significant difference. Your students’ average was significantly lower (p < .05) with an effect size less than .3 in magnitude. Due to their positive associations with student learning and retention, special undergraduate opportunities are designated "high-impact." For more details and statistical comparisons, see your High-Impact Practices report. The opportunities include learning community, service-learning, and research with faculty. Of the students who participated in two or more HIPs, Laurier students had a 10% participation rate compared with Ontario's 7% participation rate. Of the students who participated in one HIP, Laurier students had a 47% participation rate compared with Ontario's 40% participation rate. The opportunities include learning community, service-learning, research with faculty, internship, study abroad and culminating senior experience. Of the students who participated in two or more HIPs, Laurier students had a 45% participation rate compared with Ontario's 52% participation rate. Of the students who participated in one HIP, Laurier students had a 33% participation rate compared with Ontario's 27% participation rate. The comparison group featured in this report is Ontario. See your Selected Comparison Groups report for details. The academic challenge theme contains four engagement indicators as well as several important individual items. The results presented here provide an overview of these individual items. For more information about the academic challenge theme, see your Engagement Indicators report. To further explore individual item results, see your Frequencies and Statistical Comparisons, the Major Field Report, the Online Institutional Report, or the Report Builder – Institution Version. The figure below reports the average weekly class preparation time for your first-year and senior students compared to students in your comparison group. During first year, Laurier students spent 15.0 average hours per week preparing for class compared to Ontario's 15.7 average hours per week. 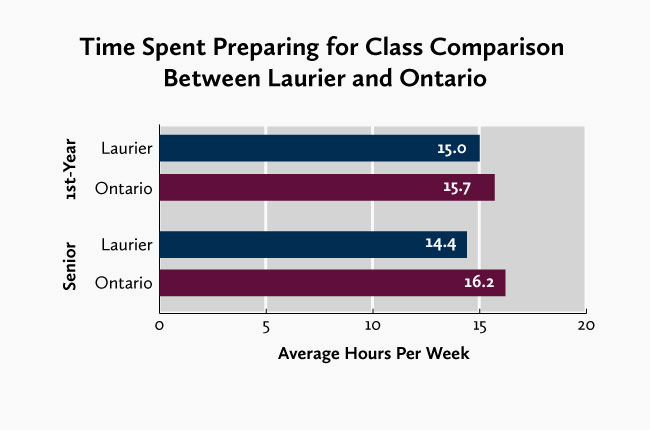 During senior year, Laurier students spend 14.4 average hours per week preparing for class compared to Ontario's 16.2 average hours per week. These figures summarize the number of hours your students spent reading for their courses and the average number of pages of assigned writing compared to students in your comparison group. Each is an estimate calculated from two or more separate survey questions. 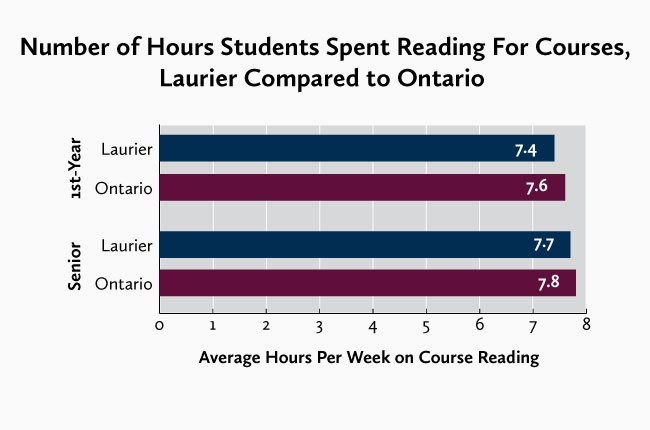 During first year, Laurier students spent 7.4 average hours per week on course readings compared to Ontario's 7.6 average hours per week. During senior year, Laurier students spend 7.7 average hours per week on course readings compared to Ontario's 7.8 average hours per week. Note: The reading item is limited to 2014 institutions. During first year, Laurier students had 62.5 average number of pages of assigned writing in their current year compared to Ontario's 62.9 average number of pages. 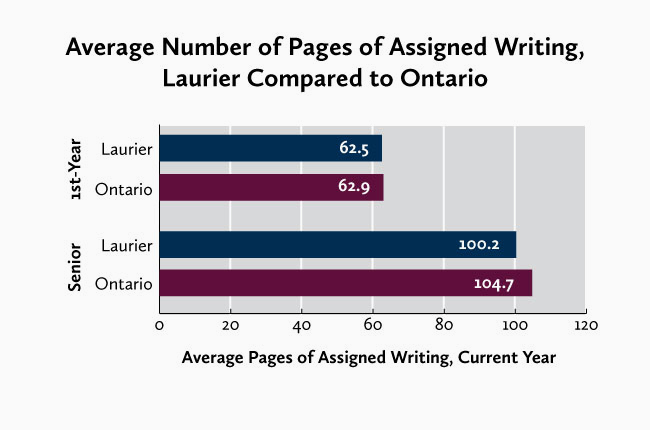 During senior year, Laurier students had 100.2 average number of pages of assigned writing in their current year compared to Ontario's 104.7 average number of pages. To what extent did students' courses challenge them to do their best work? Response options ranged from 1 = "Not at all" to 7 = "Very much." How much did students say their institution emphasizes spending significant time studying and on academic work? Response options included "Very much," "Quite a bit," "Some," and "Very little." First-year students: 83% of Laurier students responded with "very much" or "quite a bit" compared to 83% of the Ontario response. 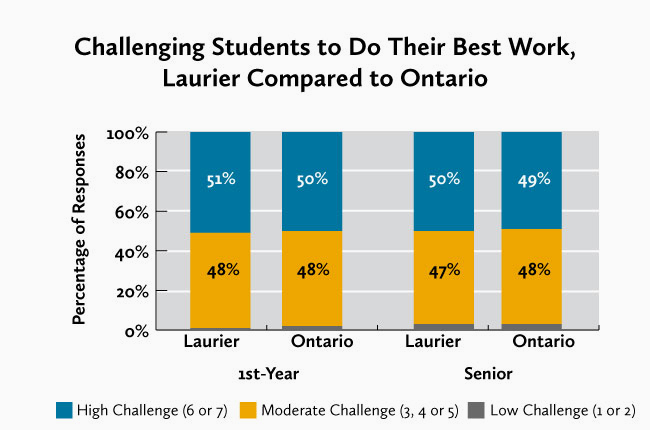 Senior students: 76% of Laurier students responded with "very much" or "quite a bit" compared to 83% of the Ontario response. By examining individual NSSE questions, you can better understand what contributes to your institution's performance on engagement indicators and high-impact practices. This section displays the five questionsa on which your first-year and senior students scored the highest and the five questions on which they scored the lowest, relative to students in your comparison group. Parenthetical notes indicate whether an item belongs to a specific engagement indicator or is a high-impact practice. While these questions represent the largest differences (in percentage points), they may not be the most important to your institutional mission or current program or policy goals. For additional results, refer to your Frequencies and Statistical Comparisons report. a. The displays on this page draw from the items that make up the 10 engagement indicators (EIs), six high-impact practices (HIPs), and the additional academic challenge items reported on page 2. Key to abbreviations for EI items: HO = Higher-Order Learning, RI = Reflective & Integrative Learning, LS = Learning Strategies, QR = Quantitative Reasoning, CL = Collaborative Learning, DD = Discussions with Diverse Others, SF = Student-Faculty Interaction, ET = Effective Teaching Practices, QI = Quality of Interactions, SE = Supportive Environment. HIP items are also indicated. Item numbering corresponds to the survey facsimile included in your Institutional Report and available on the NSSE Web site. b. Combination of students responding "Very often" or "Often." c. Combination of students responding "Very much" or "Quite a bit." d. Rated at least 6 on a 7-point scale. e. Percentage reporting at least "Some." f. Estimate based on the reported amount of course preparation time spent on assigned reading. g. Estimate based on number of assigned writing tasks of various lengths. Students' perceptions of their cognitive and affective development, as well as their overall satisfaction with the institution, provide useful evidence of their educational experiences. For more details, see your Frequencies and Statistical Comparisons report. Students reported how much their experience at your institution contributed to their knowledge, skills and personal development in 10 areas. Percentage of Fourth-Years Responding "Very Much" or "Quite a Bit"
Students rated their overall experience at the institution, and whether or not they would choose it again. Among first-year students at Laurier, 85% rated their overall experience as "excellent" or "good" compared to the Ontario group who provided a 79% rating. Among senior students at Laurier, 86% rated their overall experience as "excellent" or "good" compared to the Ontario group who provided a 79% rating. Among first-year students at Laurier, 86% would "definitely" or "probably" attend this institution again compared to the Ontario group's 83%. 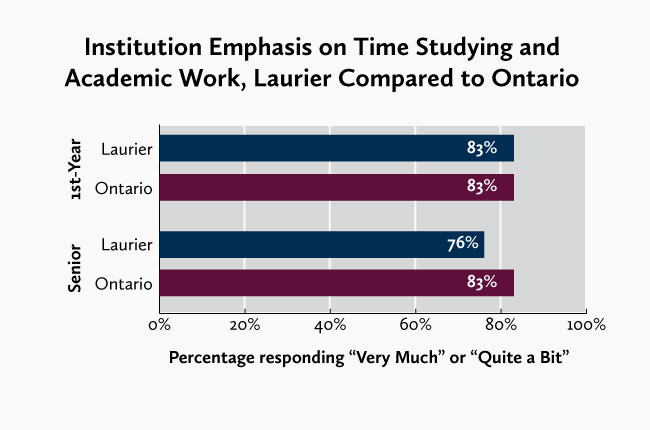 Among fourth-year students at Laurier, 81% would "definitely" or "probably" attend this institution again compared to the Ontario group's 76%. Refer to your Administration Summary and Respondent Profile reports for more information. See your Topical Module and Consortium reports for results.